A California man successfully halted a foreclosure sale on his property using the newly minted California Homeowner Bill of Rights to obtain a court injunction against two foreclosing parties: Bank of America and its ReconTrust Co. subsidiary. For simply obtaining the HBOR injunction, the homeowner’s attorney is requesting $20,255 in legal fees and costs – a compensation request that is permissible under HBOR since the legislation allots borrowers reasonable attorneys fees and expenses for successfully obtaining an injunction…. This is one of the first legal disputes to show the real strength of HBOR and it’s effectiveness in stalling proceedings and increasing expenses for servicers that are accused of violating one of the provisions of HBOR. The new case in question – Singh v. Bank of America (Recontrust Co.) – was filed by a borrower who accused BofA and Recontrust of violating HBOR’s ban on dual-tracking. Singh claimed the bank failed to respond to his request for a loan mod before filing for a foreclosure sale…. So the judge’s view is the borrower is likely to win. Ahem, so that means it is probable that BofA did indeed dual track, which is hardly surprising given the independent reports of continuing abuses. Yet the amusing part of this article is the misplaced righteous indignation of the only commentator this case, attorney Robert Jackson of Jackson and Associates. The nerve of borrowers using their rights under the law! f you add in the bank’s own attorney fees, the injunction alone could carry a $60,000 price tag, Jackson estimates. “They now have to file an answer to this thing, and they have to produce evidence showing they are in compliance before this case can go on,” he added. Not to mention, the bank is now subject to discovery – with those costs possibly running the financial firm another $50,000 at least, Jackson said. The servicer also will have to pay legal fees and expenses to make a factual showing to set aside the injunction, which could be another $50,000 to $60,000 in legal expenses, Jackson suggested. Meanwhile, the property in question has an online estimate of around $273,000, the veteran real estate attorney pointed out. So when you assess legal fees long-term, servicers could face $100,000 or more in legal expenses on a property not worth much more. This is a classic example of the Upton Sinclair saying, “It is difficult to get a man to understand something when his salary depends on his not understanding it.” Servicers and their allies continue to regard breaking the law as their prerogative. The fact that violating dual tracking requirements in California can result in servicers incurring all sorts of costs is a feature, not a bug. It’s clearly going to take a lot of being whacked between the eyes with a two-by-four to get the message, so the sooner more borrowers come after them, the better. This entry was posted in Banana republic, Banking industry, Politics, Real estate, Regulations and regulators on May 9, 2013 by Yves Smith. Someone has to help these bankers kick the booze, hookers, and blow.. and all those Fed welfare checks, it’s just embarrassing. The help has to come from somewhere and California is just the place. Looks like Yves is right about her posting the other day, you shouldn’t wait to get the perfect, clean person for the job. Go with the ones you have and work with what they produce. This is interesting to see and a bit surprising out of California. Will it hold up to lobbying pressure on the legislature and make a difference nationally? Time will tell…it is nice to see some good signs like this. Chances of being overturned on appeal? Curious. One of thse days when you would love to hear Jackson complaining in person, and when he is all done ranting you get to say to him, “Expensive, well it looks like you all shouldn’t have dual-tracked the homeowner then, eh?”. Hah! I’ve always thought we’d have gotten Bin Laden a lot earlier if we’d just turned the plaintiff’s bar loose on him. Loser pays is good. Even better would be allowing the use of the consumer protection laws that exist in most states to allow treble damages in addition to attorney’s fees. The award should be assessed directly against the miscreant servicers, with no pass along to investors. And no allowing the servicers to settle via class action….they need to fight it out case by case with a horde of hungry lawyers. That’ll fix ’em. I hope this is a harbinger of things to come. Yves, I wrote the Homeowners Bill of Rights, along with 2 of my legislative colleagues. The major sticking point was how the legislation would be enforced. We who wrote the bill felt strongly that the homeowner should have some ability to enforce the law. Without the ability to sue the foreclosing institution, the legislation had no teeth. And without the ability of the homeowner to seek attorney’s fees, the homeowner would likely have no legal representation. Glad to see the legislation is working as intended. However, one of the problems we now have is that now our courts are severely underfunded so even if the homeowners can sue, they may never have their day in court. Anyway, thank you for staying on top of this issue. Could not have done this without the work you do. Noreen: Thanks for showing up here and ‘thanking yves’. Your comment provides one of the best ways to know that all the hard work done by yves, lambert and others is worth it. Wow, thank you very much! This looks to be powerful legislation. I’ve had whistleblowers from Bank of America say (despite the case flagged, which is a BofA case) that BofA now handled California foreclosures differently, as in more carefully, than other foreclosures. So it’s having an impact, and banks may up their game even further after this ruling. Noreen, as regards BofA, do you know if anything has been done, or if any legislation has been sponsored, regarding California illegally forcing BofA payment cards on those on Disability and Unemployed, versus allowing direct deposit? In five states — California, Indiana, Kansas, Maryland and Nevada — unemployed [and those on State Disability] people aren’t offered direct deposit at all. The report says that setup is illegal under a federal law that bars states from requiring benefits recipients to open an account at a particular bank. Why did California do that when they already had enough evidence that people were being ‘royally’ screwed by BofA, and why did they get away with it, since it’s illegal under Federal Law? hullo? are you still reading? You are a credit to district 2 and California, Noreen. With our current SCOTUS and their AT&T Mobility v. Concepcion decision that says both negotiable and non-negotiable contracts supersede both California law as well as the Constitutional Right to a jury trial. Do you know how this do under a federal appeal especially as all banks have in their mortgage that the mortgage contract shall be governed by the laws of state x, usually Washington, Tennessee, or another state who’s law making bodies have been well bribed by the banks. Unable to dual track, I would guess that BofA, et al would be much less likely to consider mods in the future and move straight to foreclosure instead. So if anything, it should induce the banks to process more, not fewer, mod requests by qualified borrowers. Does the law require the bank to consider every loan mod request? Does it define in strict terms what their due diligence would be in considering a loan mod request. 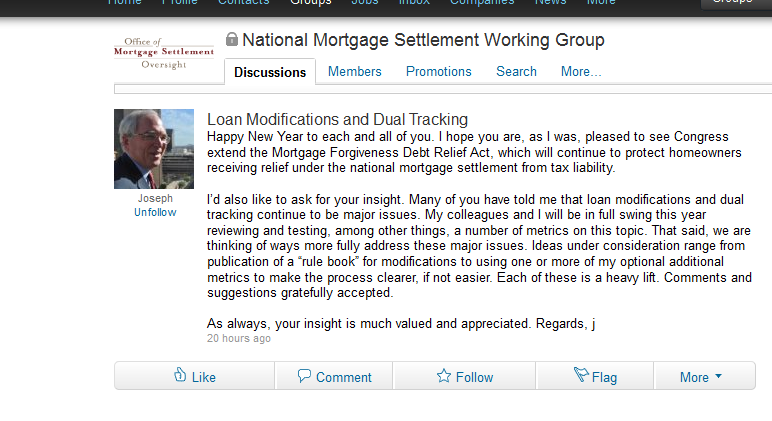 Why would a bank now care to go down the road to a loan mod when they might be accused of dual tracking. The risks and costs of an accusation of dual tracking are potentially infinite whereas the costs of going straight to foreclosure are generally well know. Your comment is a serious reading comprehension fail. The banks are REQUIRED to consider a request for a loan mod. They are REQUIRED to stop moving forward with a foreclosure while the request is being considered. There are various existing categories of mods (such as HAMP2) that stipulate LTVs and DTI levels. So yes, there are established templates and if the borrower falls in any of those and provides the documentation required, they get a mod. Period. Plus the banks have their own proprietary mod programs where they have more latitude. I don’t have time to look up details, but there are stipulated timeframes (as in the bank has to notify the borrower of their right to ask to be evaluated, the borrower has to make the request within a certain # of days, the bank then has to evaluate and make a determination within a certain # of days). This suit and all the costs the bank lawyer is bitching about results from the FAILURE to process a request for a mod. So your basic premise is 100% wrong. NOT processing validly submitted requests for a mod and/or continuing to dual track in those cases will get the banks in hot water. The biggest danger to the banks in the HOBR is the facilitation of litigation which gives the homeowner the right of discovery. If enough homeowners go for discovery it will expose the fraud currently concealed inside the labyrinth of MERS. It will expose the obvious: The banks have no interest whatsoever in the mortgage. I was an early homeowner-participant in the HAMP fiasco. It consisted of 14 months of submitting mountains of often misplaced paperwork and then being lied to by Chase reps. I was dual tracked probably automatically from day one, simply because I had submitted an application for a loan modification. While being falsely assured by bank reps whom I contacted that all was well and a modification imminent, I also began receiving harassing letters and phone calls from a very rude and incoherent woman demanding payment. But I had never missed a payment, a fact which I could not make her understand. But then, her English was quite poor. This was the beginning of the end of my confidence in Obama as a reformer. The dude’s a dud, a maintenance man for the masters. If you add in the bank’s own attorney fees, the injunction alone could carry a $60,000 price tag, Jackson estimates. So what California has done, is guaranteed full lawyer employment. The HOBR isn’t necessarily a bad idea, but in reality it’s just more of a band-aid on a self-inflicted bullet wound. We keep arguing about edge cases when the real problem is systemic insolvency. I suppose it’s more fun to gripe about the former than the later. The losses were made, when the loans were made and arguing about the process of foreclosure, while not wrong, is still just a distraction. Until someone in (real) power, actually stops the flow of money to the TBTF, nothing of lasting value will occur. It is heartening though that in the land of midgets California’s is at least a bit taller than the rest. We lost our home in San Francisco that has been in the family for many years in Oct. 2012 because of dual tracking and I cannot find an attorney that knows anything about dual tracking to help us. I was current with the first loan and my Son was behind on a second loan which I did not know. Because he was on the loan he was working it out with the bank to modify it but they foreclosed on it. There is alot of equity in the house. Please help us! Are you pre or post trustee sale? My office won this victory in the article and we could probably help you too. http://www.aldonlaw.com. How about asking the attorney who finally achieved this victory for the homeowner? Its ME. The bank now wants to settle quietly and confidentially. What should we do?